This photograph was used in the 1981 action 'Gold found by the artists' performed at the Art Gallery of NSW, but is a record of another action 'Anima mundi: tango' performed at the First Australian Sculpture Triennial, Latrobe University, Melbourne in 1981. Bernice Murphy, Art and Australia (Vol. 19, No. 3) , 'Gold found by the Artists', pg. 340-342, Sydney, Autumn 1982, 340-342, 341 [illus.]. Michael Wardell, Contemporary: Art Gallery of New South Wales Contemporary Collection , 'Ideas and actions', pg.60-107, Sydney, 2006, 66, 67 (colour illus.). 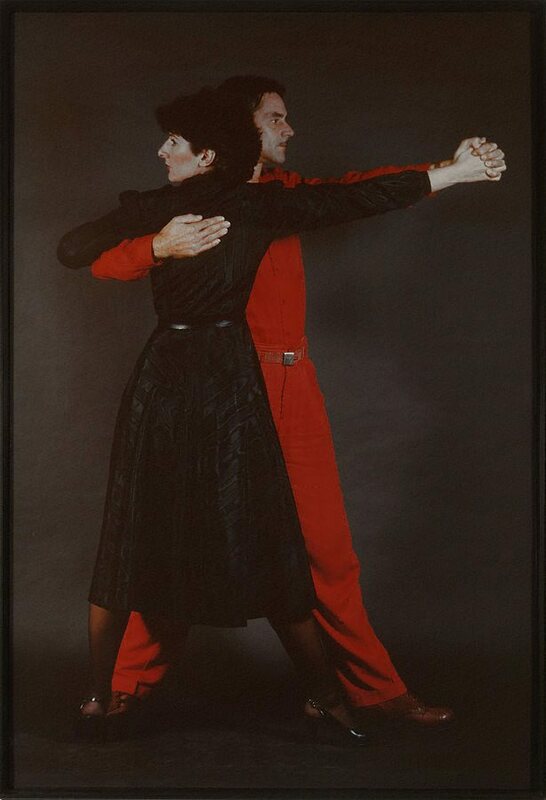 The third hand: collaboration in art from conceptualism to postmodernism , 'Missing in action: Marina Abramovic and Ulay', pg.157-177, Minneapolis, 2001, 156 (illus. ), 157-158, 168, 170-173, 175-176, 180, 185-186. These two chapters refer to the 'Gold Found by the Artists' action and the 'Nightsea Crossing' series of performances. Abramovic , 1993, 172, 173 (illus. ), 180, 181 (illus. ).